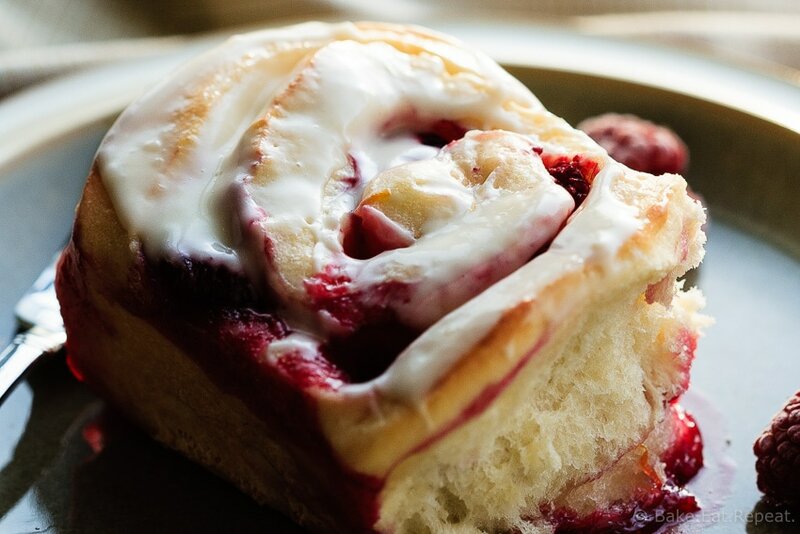 Lemon Raspberry Sweet Rolls - Bake.Eat.Repeat. Tender sweet roll dough filled with a lemon raspberry filling and topped with a sweet lemon glaze, these lemon raspberry sweet rolls make a perfect treat! I’ve been a bit obsessed with lemon lately. Maybe because it’s February and I always start longing for spring about this time. Maybe because it feels like spring this year even though it’s only February. It’s actually kind of annoying. I hate to say that, because really, when it’s cold we whine about how cold it is here – and this year it’s been SO warm, and we’re whining about that. Well, my kids are I are. It’s a little irritating though. I kind of like winter. Not when it’s 35 below and you can’t even go outside, but most of the time it’s not that cold and winter stuff is fun. My kids are finally all old enough that we can get out and do all that fun stuff without worrying about what to do with the baby and who needs a nap and is too tired to stay up past 7. All the kids are skating on their own, we don’t have to break our backs helping someone. They can drag their own sleds up the hill. They can all put on all their own snow stuff – it’s not a half hour process to get out the door. And there’s no snow. Or not enough to actually GO sledding. And I’m scared to let the kids out on the ice to skate because it’s been so warm that I’m envisioning them falling right through in a thin spot. It’s February. We should be outside. But the irritating thing about living in a wintery location is that when winter is really warm and snow-free, there’s not a whole lot to DO outside. It’s just kind of mucky and brown and blah. So we’re actually inside more right now then we typically are in the winter. Oh well. Spring! We’ll just pretend it’s already spring and start hoping for the flowers that won’t appear for another couple of months. And eat all the lemon things because they scream spring. 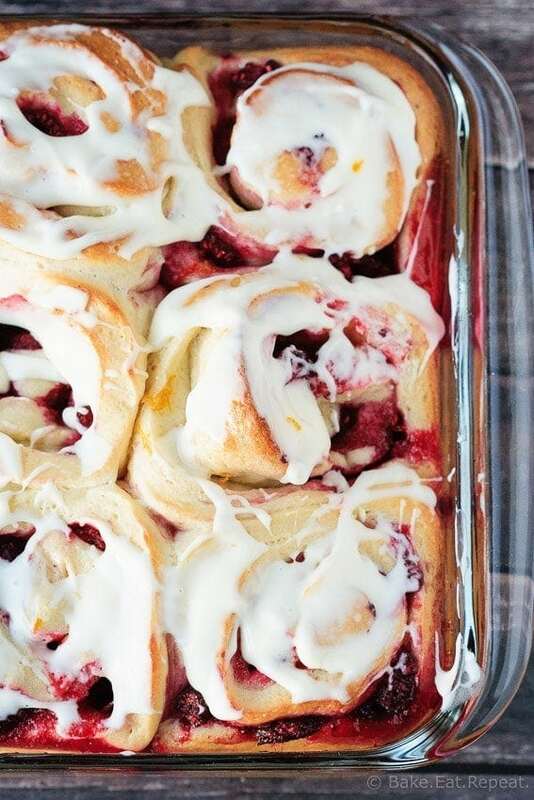 These lemon raspberry sweet rolls definitely scream spring to me. So if you’re longing for spring already, you should whip these up for a special weekend brunch. Even if you’re not (or you live somewhere where it’s always warm!) 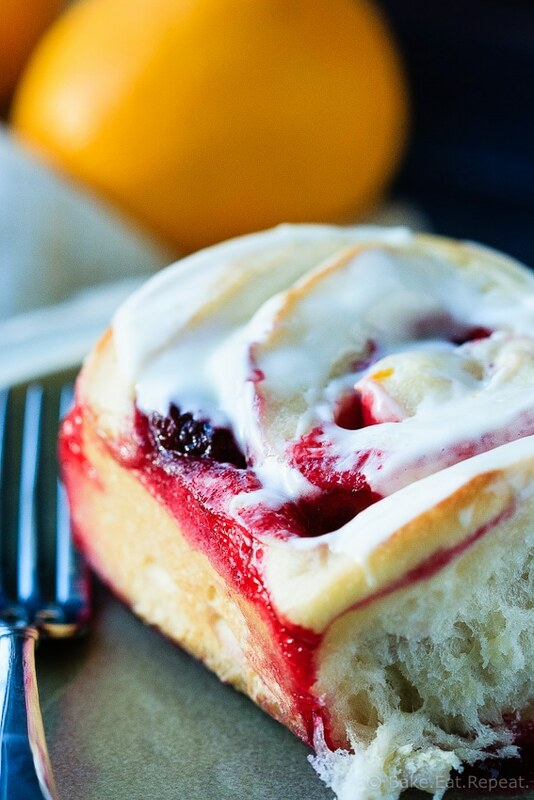 you should make these lemon raspberry sweet rolls because they are incredible. Tender sweet roll dough filled with a lemon raspberry filling and topped with a sweet lemon glaze. Fantastic. I may have even enjoyed them more then these chocolate orange sweet rolls that were one of the best things I ever made. Decadent, yes. Amazing and necessary and perfect for Valentine’s Day? Yes. In a small bowl, mix together the butter, lemon juice, lemon zest and granulated sugar for the filling and set aside. Punch down the risen dough and turn it out onto a lightly oiled counter. Roll it out to about 1/2 inch thick rectangle, about 12 by 14 inches. With a rubber spatula, spread the filling over the dough, leaving 1/4 inch space around the edges. Sprinkle the raspberries evenly over the filling. Starting from one long side, roll the dough up into a log, keeping it even as you roll. Pinch the seam closed with your fingers and lay the log seam side down on the counter. Using a serrated knife, slice the log into 12 even pieces. Place the rolls, cut side down, in a 9x13 inch pan and cover the pan tightly with plastic wrap. While the buns are baking, make the icing. With an electric mixer, whip the cream cheese, lemon juice and lemon zest until smooth and creamy. Add the powdered sugar and whip again until smooth. Set aside, covered tightly with plastic wrap. When the sweet rolls are finished baking, allow to cool in the pan for 5-10 minutes, then spread the lemon cream cheese icing over top of the warm rolls. Serve warm. Keep any leftovers in a sealed container in the refrigerator, they reheat well in the microwave. The prep time is hands on time and does not include the rising times. There are several options with the rising and baking of these. You can shape the rolls and then refrigerate for up to two days, pulling them out 3-4 hours before baking to allow them to rise. Or you can let them rise immediately after shaping and then refrigerate for up to 2 days, pulling them out and allowing them to come to room temperature, 30-60 minutes, before baking. Or you can let them rise immediately after shaping and then bake right away. The total time listed does not include the rising periods. Also, I used Meyer lemons, but these would be fantastic with regular lemons as well! Source: Adapted from my Chocolate Orange Sweet Rolls , lemon cream cheese icing from Mel's Kitchen Cafe . Do you leave the raspberry frozen? Yes you use them frozen in the rolls, you don't thaw them first. Hi, is it okay to make the dough the night before or should it not sit longer than 2 hours? You can make it the night before. Just let it rise at room temperature for the 2 hours it takes to double, then punch it down, cover and refrigerate overnight. Or you can shape the rolls and then cover and refrigerate overnight if you like, it will be fine either way. You'll want to let it come back to room temperature (about an hour) before shaping the rolls though, or if they're shaped, add in some time for the second rise as they'll need to come to room temp before they rise. No worries - hope you enjoy them! Me too! I can’t wait to make these! I’ve made a few of your recipes Stacey, and they are always mouth watering and girl- you know how to bake! Thank God I don’t live next door to you! I would be in your kitchen daily! Thanks, and keep those great recipes coming! Yes you can. I would recommend adding 2 teaspoons of vinegar or lemon juice to the milk and letting it sit for about 5 minutes before using it. This will sour the milk and give a good substitute for buttermilk. In fact, more often then not, that's what I use as I rarely have buttermilk on hand! I am definitely craving spring and all things citrus right now! I think it's because it has been so unseasonably warm...I have a taste of spring and now I want more ;) And clearly I want one of these sweet rolls too! They look amazing! I've been loving lemons lately too and they're soooo good paired with berries! These sweet rolls look absolutely irresistable! I'm ready to skip ahead to Spring, so these sweet rolls are calling my name! They look delicious! I'm loving all of the lemon treats too, because I'm wishing for warmer weather! We don't have a lot of snow here either, but it is COLD! I think these sweet rolls would take me back to summer days. Love the raspberry and lemon combo, Stacey! Sounds perfect for breakfast or dessert! Actually it's funny, after writing this I woke up yesterday morning to 3 inches of snow and it's still snowing - my kids are thrilled - and it's much prettier now! :) Thanks Gayle! These sweet rolls are stunning :) Love the color!